The garden! It's become a feature of our days, at last! Tiny Owlet loves being outside more than anywhere else. She loves dirt and grass and chooks and sky and water... Little Owlet is now comfortable enough with dirt and bugs that she enjoys the garden now too (yay!). So we've been spending more time out there, thinking, planning, talking, dreaming. 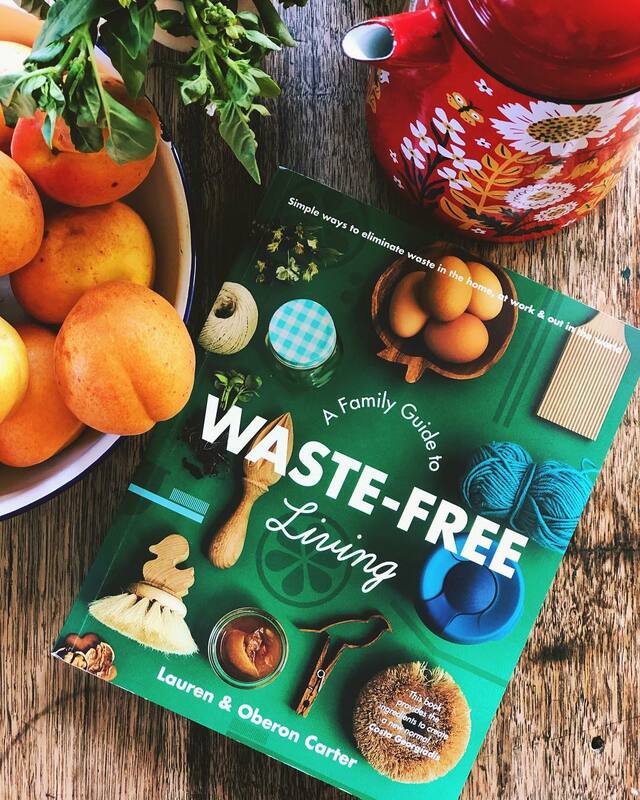 We are generally opposed to large expanses of lawn and all the effort maintaining them brings, and yet we keep finding ourselves in houses with nothing but lawn... Our eventual plan is to fill as much of the garden with food as possible. And in between, some indigenous plants to keep the local wildlife happy. We began with some fruit trees a few years ago, then more a year later and when burying Pippin and Little and Tiny Owlet's placentas. We've had a successful vegie patch. Then watched it turn to weeds as babies were born and grew and were born again. We've grown disheartened at the prospect of starting again. 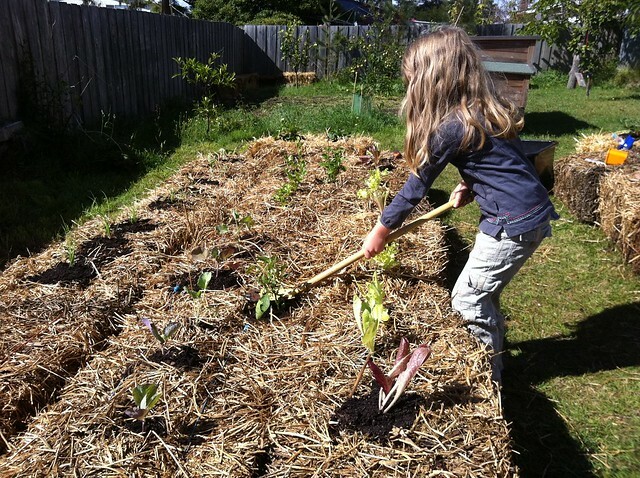 Then we mowed the vegie patch to the ground and it self-seeded and was fantastically productive, despite our neglect. So we've learnt to embrace the weeds somewhat. This week we bought some bales of lucerne and barley straw and we are beginning an experiment, which our neighbour is watching with much interest, as are we. 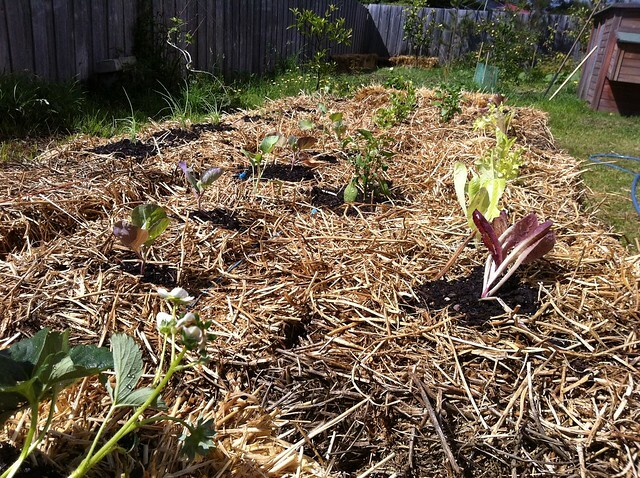 Two raised straw bale garden beds, planted with vegies and strawberries. Some are seedlings, grown locally and bought at the farmers' market. In the next bed, we've planted some seeds so our crops are staggered a little bit. Finally we can see some structure and the edible part of our garden is expanding, while the lawn disappears. 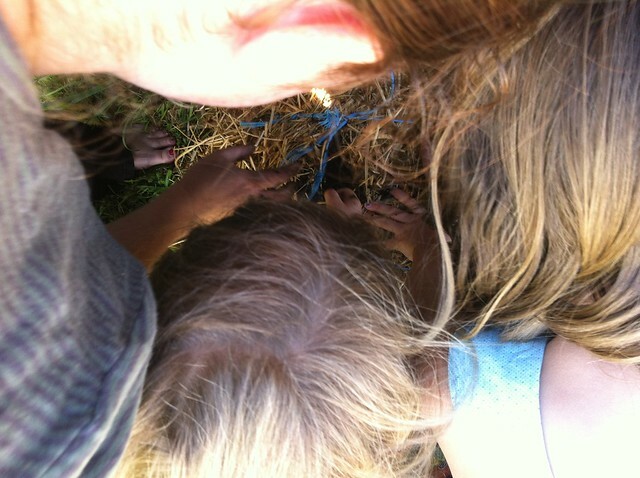 The owlets have enjoyed dirty hands and outdoorsy work, but especially Little Owlet who seems to really get the whole kitchen garden concept in her very practical, hands on way. We're all learning. Gardening is all about learning and experimenting. That's what I love about it most of all... aside from the food. And all the green. No dig gardens are fantastic. Be patient and it will all turn into beautiful, composty soil. I did in at the Purple Nest but I was so impatient I left the hay/no dig bed and made some normal soil based ones. 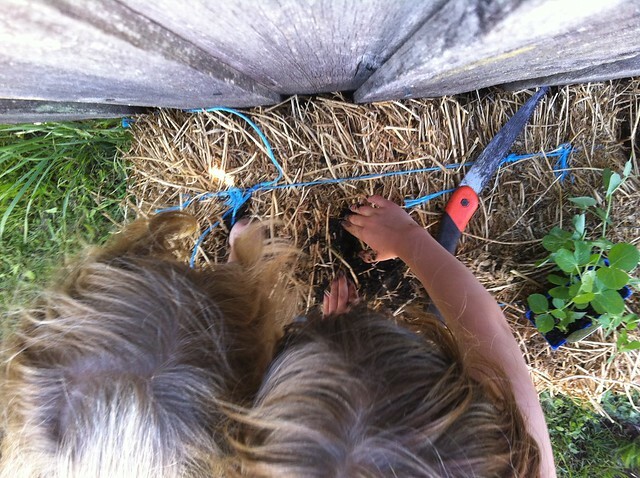 Eventually the straw one turned into the most gorgeous growing soil ever. And all you have to do is pop some supports around it and you'll have a permanent growing space. can't wait to see some piccies of the progress. I'm curious about the perennial understorey, what is going in there?